A good understanding of the basics of color theory is important for any designer be it a designer of fashion, interiors, architecture, fine art, webpages, textiles, floral arrangements, landscapes, make-up application or anything else for that matter. In primary school perhaps you were taught that red, blue and yellow are the primary colors and violet, green and orange were the secondary colors. 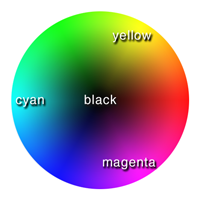 This is true on a 12-color scale of primary, secondary and tertiary colors. This system is very limiting. In reality primary colors would all be of the same level of brightness. Yellow is much brighter than red or blue. In the subtractive color system colors are produced by subtracting light and when all colors are mixed the result is black. In the additive color system colors are produced by adding light and when all colors are mixed the result is white. Mixing of colors is done in the eye. In color theory it is understood that there exist colors which are not visible by the human eye. Just like a dog is only able to perceive colors on the white, grey, black spectrum, humans are only able to perceive colors in the primary, secondary, tertiary color spectrum. Pastels are made by mixing grey with any other color. 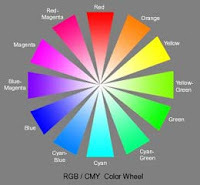 View an informative video about the color wheel.